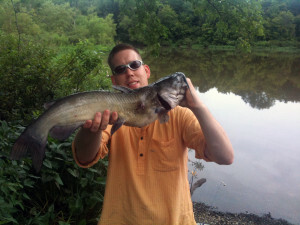 Virginia is one of the best cat fishing locations in the United States. It is absolutely amazing. The largest blue catfish (143 lb) in the world has come out of Kerr Reservoir (Buggs Island Lake) on the North Carolina/Virginia border. 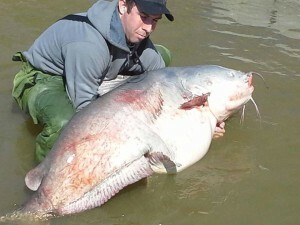 The James River is one of the best blue catfish rivers in the world with 60 lb catfish being common. Fishing guides like Chris Eberwien who fish the James River every day give a 30 lb catfish money back guarantee to their clients that is how confident they are in their ability to catch large cat fish. The tidal Potomac is quickly becoming an amazing blue catfish fishery as the catfish grown with the rebounding gizzard shad and herring populations. The middle James River, Smith Mountain Lake, the Rappahanock and the Occoquan Reservoir are great location for flathead catfish. And channel catfish can be found everywhere. Big blue catfish are in all of the big tidal rivers of Virginia and Kerr Reservoir (Buggs Island Lake). The tidal rivers and Chesapeake bay are home to commercial blue catfish fishing that provide the US with catfish fillet and live blue catfish that are used to stock watersheds across the US. Anywhere in Virginia where you find large schools of shad or herring you will find trophy blue catfish. These large 2-3 pound shad are the perfect bite size for 50+ lb blue catfish. In Virginia the ultimate trophy blue catfish bait is cut shad. On the James river 10 to 12 oz leads on a slider with 10/0 circle hooks and 1/3 a 3 lb shad is the ideal giant blue cat bait. Cut shad works everywhere but it can be hard to get in many places, including the Potomac river where harvesting tidal shad and herring is not permitted. Cut blue gill, clams, halibut pellets, chicken liver and even worms work well. Hi-low rigs are very popular for bank fishing for blue catfish across Virginia and in the large tidal rivers. Channel Catfish are found through out Virginia and 4-5 lb channel cats are common. The state record channel catfish came out of the Rappahannock River at 31 lbs 8 ozs. Channel catfish are feisty and the action can be super hot. Cut bait fish, crab flavored boilies, halibut pellets, chicken liver, worms, punch bait, stink bait and works really well with channel catfish. Channel catfish in Virginia tend to be along the shore lines and emergent weed beds in the summer time and in the deeper channels in the winter. My favorite rig for catching channel catfish in Virginia is a fish finder rig with a 4/0 Gamagatsu circle hook and a 2″x2″ piece of cut bluegill or shad. Virginia does not have the largest flatheads in the states but it still has some great flathead rivers and lakes. Smith Mountain lake and the Middle James river are well known for their flat heads. The New River is also pretty decent. The State record flathead came out of Occoquan reservoir at 66 lbs. 4 oz. The Occoquan reservoir has a small population of flatheads but they are very big. 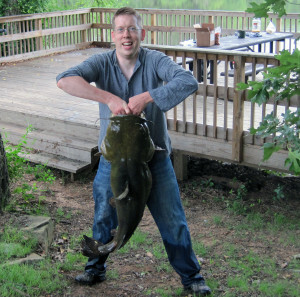 The best rigs for catching flathead catfish in Virginia is using live bait on a fish finder rig or under a bobber. Flatheads lover live bait and it can be hard to catch them on dead bait sometimes. You can also catch flatheads on lures. So remember, Virginia cat fishing is some of the best in the US, so if you live in the Virginia area and you have not gotten out and caught some catfish don’t put it off any longer.